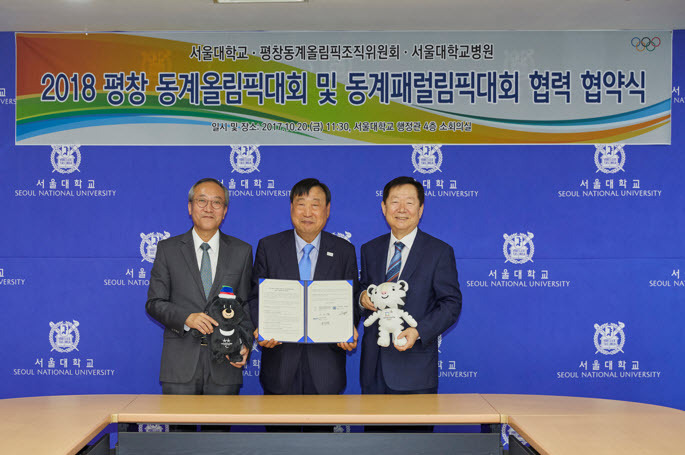 (From left to right) SNU Hospital President Suh Chang-Suk, PyeongChang 2018 Organizing Committee President Lee Hee-beom, and SNU President Sung Nak-in. With the PyeongChang 2018 Winter Olympics just around the corner, South Korea is meticulously preparing to accommodate the athletes from all around the globe and the thousands of people who will fly in to attend the 16-day long event. As with any sporting event, the health and physical condition of the athletes are of utmost importance. In order to ensure top quality medical care for the competing athletes and the members of the organizing committee, the SNU Hospital held a convention at the end of last month marking its agreement to provide medical services for the 2018 PyeongChang Olympics. At the convention, SNU President Sung Nak-In, SNU Hospital President &CEO Suh Chang-Suk, and PyeongChang 2018 Organizing Committee President &CEO Lee Hee-beom were all present. At the convention, the SNU Hospital and the organizing committee discussed topics such as the Olympic village facilities and their usage, coordination of the thousands of volunteers, and the overall functioning of the campus. SNU Hospital will provide a Chief Medical Officer (CMO) and the medical staff needed to the five skating rinks and two training centers. President Sung stated that he was “honored that SNU has the opportunity to help a national event such as the PyeongChang Olympics succeed,” and he affirmed that the SNU hospital will do everything that it can to provide the best possible services.